We start where the others turn back!! 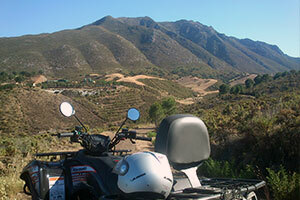 We offer fantastic off road quad biking in the heart of some of the most stunning scenery in all of Spain. We operate the highly acclaimed Kawasaki KVF 300 quads which are fully automatic. These machines are suitable for beginners through to more experienced riders. ALSO see our regular Special Offers. 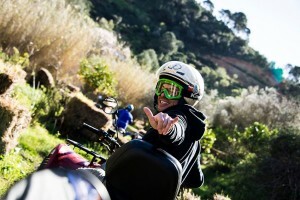 Our costs include bikes, fuel, insurance, guides, water, gloves, goggles and helmets. You provide suitable clothing and driving license. For younger children or for those that like to travel in comfort we have a seven seat, air conditioned Land Rover that can accompany any tour. Please call on +34 680 799 231 to confirm availability or complete our Enquiry Form.